Menu Skip to content Reviews Industry News Concealed Carry 2nd Amendment More Gun Bazaar The Wire Search Search Kristin Alberts Kristin Alberts Growing up with a gun in her hand and a deep love of the outdoors, Kristin has always been involved with the shooting culture and preservation of our second amendment rights. With degrees in English and creative writing, her passion for writing is right on target with her love for firearms. She is an avid trap & sporting clays shooter; brass and shotshell reloader; and hunter of whitetails, bear, turkey, and geese. If shopping firearms personal ads, she’d gravitate to Belgian-made long guns, Mauser actions rifles, and classic wheel guns. Outside of writing, shooting, and hunting Kristin spends as many hours in the great outdoors as possible ice fishing and operating a Great Lakes salmon fishing boat. She also enjoys cooking, antiquing, photography, writing poetry, and responding to 911 calls as an EMT. Her first book of poetry, Where Water Might Be Blue was published in 2006. What’s even more American than turkey, cranberries and pumpkin pie these days? An Italian gun, that’s what. The only known surviving firearm that crossed the wild Atlantic aboard the good ship Mayflower, settled with the pilgrims at Plymouth Colony and ultimately helped the first colonists not only survive, but prosper. 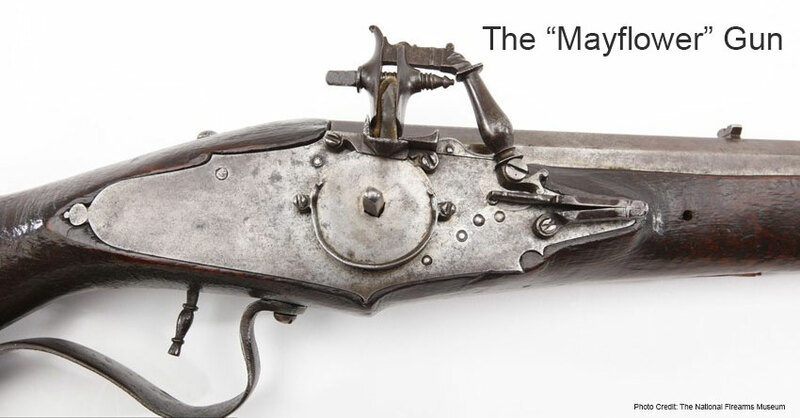 Meet the Mayflower Gun.